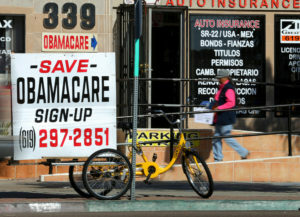 WASHINGTON — The number of U.S. adults without health insurance is up nearly 3.5 million this year, as rising premiums and political turmoil over “Obamacare” undermine coverage gains that drove the nation’s uninsured rate to a historic low. That finding is based on the latest installment of a major survey, released Friday. The Gallup-Sharecare Well-Being Index asks a random sample of 500 people each day whether they have health insurance. The survey found that the uninsured rate among adults was 12.3 percent during the period from July 1-Sept. 30, an increase of 1.4 percentage points since the end of last year. The increase in the number of uninsured is more striking because it comes at a time of economic growth and low unemployment. The annual sign-up season for subsidized private insurance plans under the Affordable Care Act starts Nov. 1, but it may not make much of a difference. President Donald Trump has stopped federal payments that reimburse insurers for lower copays and deductibles that the Obama-era law requires them to provide to people with modest incomes. His administration slashed the advertising budget for 2018 sign-ups, cut the length of open enrollment in half, and sharply reduced federal grants to groups that help consumers navigate the process. “The number of uninsured Americans likely will continue to rise,” the Gallup-Sharecare analysis noted, unless Trump and Congress take steps to stabilize insurance markets. A bipartisan bill to restart the canceled insurer payments faces opposition from conservatives and Trump has sent mixed signals. While “Obamacare” remains politically divisive, its coverage expansion helped about 20 million people get health insurance, bringing the uninsured rate to a historic low. Continued progress seems unlikely now. Next year’s premiums for plans sold on the health law’s marketplaces are expected to increase significantly in many communities, and insurer participation is down sharply, with about half of U.S. counties having only one carrier. Although consumers who are eligible for ACA subsidies are shielded from price hikes, many who buy individual plans get no financial assistance from the government. All told, more than 17 million people purchase their own policies. Independent experts who reviewed the Gallup-Sharecare findings said they appear to confirm other available evidence. GOP health economist Gail Wilensky said the overall direction of the Gallup-Sharecare results seems reasonable, but she’ll await confirmation from government surveys that take longer to produce results, but dig deeper. Except for seniors covered by Medicare, the Gallup-Sharecare survey found that the uninsured rate increased among all major demographic groups. The loss of coverage was concentrated among middle-aged adults, with the uninsured rate rising by 1.8 percentage points among those 35-64 since the end of 2016. Households making less than $36,000 a year saw their uninsured rate go up by 1.7 percentage points. Among Hispanics, the rate increased by 1.6 percentage points, and among blacks the increase was 1.5 percentage points. The Gallup-Sharecare results are based on telephone interviews conducted July 1-Sept. 30, with a random sample of 45,743 adults, aged 18 and older, living in all 50 states and Washington, D.C. The margin of error is plus or minus 1 percentage point.